Even though our winter has been mild to say the least we have been able to enjoy our snow time activities. I’ve been out cross-country skiing numerous times and the trails are in great condition. Of course I would like to spend more time skiing and get my snowshoes out but there are only so many daylight hours. Mike was able to go for a snowmobile ride the other day. He took Matt and Cassidy along and they had a fabulous time. 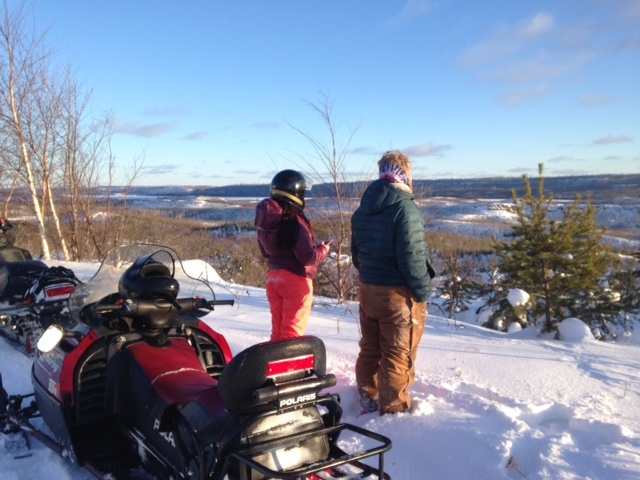 They were amazed at the views and all of the animal tracks. Mike in the lead, saw tracks of wolf, moose, lynx and fox but no otter slides. If you’ve ever wanted to experience winter on the Gunflint Trail then come on up to Voyageur Canoe Outfitters. It’s a magical place and there is plenty of snow for fun.